Here comes another chapter in the series of CCC Study Material, today we are here with DOEACC CCC Online Practice Question Paper SET-G with Solutions / Answer keys. 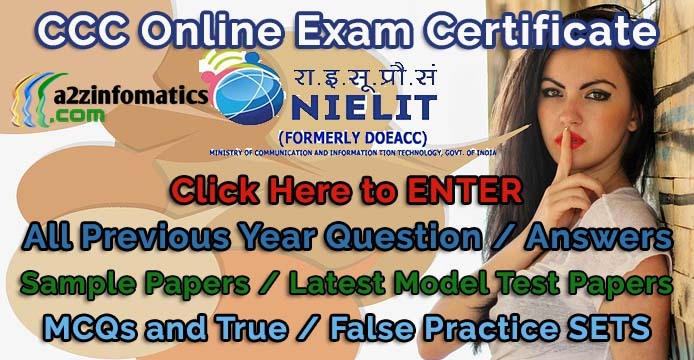 All the published CCC Previous Year Online Question Papers with Answer Keys will definitely help each and every CCC candidate to crack the upcoming DOEACC / NIELIT CCC Examination at first attempt. All these latest 2018 CCC Previous Year Sample / Model Test Papers are as per the latest CCC Exam Syllabus. Best of luck for your CCC Online Certificate Examination, please have a look to other CCC Question Answers Sample Paper / Practice Sets published earlier. 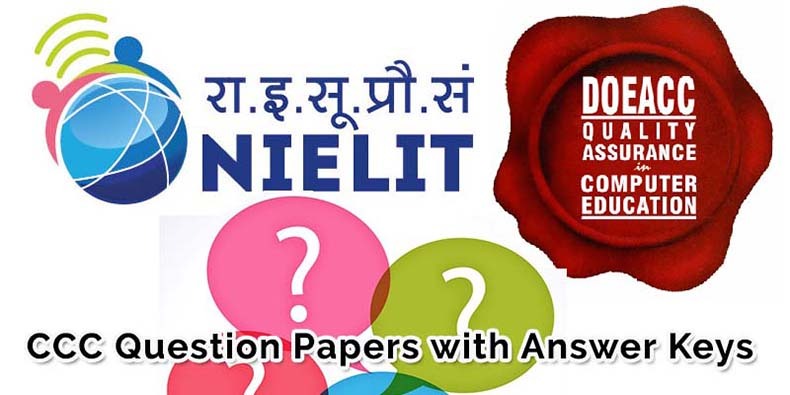 DOEACC / NIELIT CCC Practice Question Paper SET-G – Online Sample Paper with Answers – CCC Previous Year Model Test SET-G.
CCC Practice Question Answers Set G.
Note: This CCC Practice Question Paper (SET-G) consist of total 50 question with the answers at page no 4 of this post. Ques 1- The background of any Word document …………………..
(a) is always white color. (b) is the color you preset under the option menu. (c) is always the same for the entire document. (d) can have any color you choose. Ques 2- The benefits of using computers is that ……………………..
(a) computers are very fast and can store huge amount of data. (b) computer provide accurate output even when input is incorrect. (c) computers are designed to be inflexible. (a) world wide web worm. (b) world wide wildlife web. (c) world wide women’s web. (d) world wide women’s week. (a) Keyboard, Monitor, Hard Drive. (b) System Unit, Input/Output, Memory. (c) System Unit, Input/Output, Secondary Storage. (d) System Unit, Primary Storage, Secondary Storage. (a) Landline phone to mobile phone communication. (b) Wireless communication between equipments. (c) Signal transmission on mobile phones only. Ques 15- Which of the following is an example of an optical disk ? Ques 16- Which of the following is (are) an example of storage devices ? Ques 18- Which of the following is not an example of Operating System ? Ques 19- Which supercomputer is developed by the Indian Scientists ? You are now on the Page No 1 of this CCC Online Practice Question Paper with Answers SET-G. Complete Answer Keys for CCC Previous Year Question Paper Set-G on Page no 4 of this Post.